The example is made in light worsted weight mercerized cotton. Since this is a design-your-own style afghan, this pattern is presented as patterns for the individual sections and construction guidelines. This is not a traditional pattern with beginning to end instructions. It is not a beginning project. ATTEMPT AT YOUR OWN RISK. The beginning chain should be a multiple of 44 plus 10. Begin with Small Ripple A. Row 1: Dc in 4th ch from hook, dc in next 2 ch, 3 dc in next ch, dc in next 8 ch, dc5tog (uses next 5 ch), dc in next 8 ch, ** 5 dc in next ch, dc in next 8 ch, dc5tog (uses next 5 ch), dc in next 8 ch. Repeat from ** to last 4 ch. 3 dc in next ch, dc in next 3 ch. Row 2: Ch 3, turn. Dc in 2nd dc, dc in next dc, 3 dc in next dc, dc in next 8 dc, dc5tog (uses 2 dc, dc5tog, 2 dc), dc in next 8 dc, ** 5 dc in next dc, dc in next 8 dc, dc5tog (uses 2 dc, dc5tog, 2 dc), dc in next 8 dc. Repeat from ** to last 3 dc and turning chain. 3 dc in next dc, dc in next 2 dc, dc in top of turning chain. Small Ripple B: Ch 3, turn. Dc in 2nd dc, dc in next dc, dc3tog (uses dc3tog, 2 dc), dc in next 8 dc, 5 dc in next dc, dc in next 8 dc, dc5tog (uses 2 dc, dc5tog, 2 dc), dc in next 8 dc, 5 dc in next dc, dc in next 8 dc, ** dc5tog (uses 2 dc, dc5tog, 2 dc), dc in next 8 dc, 5 dc in next dc, dc in next 8 dc. Repeat from ** to last 5 stitches and turning chain. dc3tog (uses 2 dc and dc3tog), dc in next 2 dc, dc in top of turning chain. These two will be front and back of the same section. Big Ripple A: Ch 3, turn. Dc in 2nd dc, dc in next dc, 3 dc in next dc, dc in next 8 dc, dc5tog (uses 2 dc, dc5tog, 2 dc), dc in next 19 dc, 5 dc in next dc, ** dc in next 19 dc, dc5tog (uses 2 dc, dc5tog, 2 dc), dc in next 19 dc, 5 dc in next dc. Repeat from ** to last 13 stitches and turning chain. Dc in next 8 dc, dc3tog (uses 2 dc and dc3tog), dc in next two dc, dc in top of turning chain. Big Ripple B: Ch 3, turn. Dc in 2nd dc, dc in next dc, dc3tog (uses dc3tog and 2 dc), dc in next 8 dc, 5 dc in next dc, dc in next 19 dc, dc5tog (uses 2 dc, dc5tog, 2 dc), ** dc in next 19 dc, 5 dc in next dc, dc in next 19 dc, dc5tog (uses 2 dc, dc5tog, 2 dc). Repeat from ** to last 11 dc and turning chain. Dc in next 8 dc, 3 dc in next dc, dc in next 2 dc, dc in top of turning chain..
Big Ripple C: Ch 3, turn. Dc in 2nd dc, dc in next dc, dc3tog(uses dc3tog, 2 dc), dc in next 19 dc, 5 dc in next dc, dc in next 19 dc, ** dc5tog (uses 2 dc, dc5tog , 2 dc), dc in next 19 dc, 5 dc in next dc, dc in next 19 dc. Repeat from ** to last 5 stitches and turning chain. dc3tog (uses 2 dc and dc3tog), dc in next 2 dc, dc in top of turning chain. Row 1: Form a slip knot, find the stitch that is 11 stitches before the center bottom stitch and slip stitch the slip knot to it. Ch 3, dc in the next 8 stitches, dc5tog (uses 2 dc, dc5tog, 2 dc), dc in next 9 dc. Row 2: Ch 3, turn. Dc in second dc, dc in next 5 dc, dc5tog (uses 2 dc, dc5tog, 2 dc), dc in next 7 dc. Row 3: Ch 3, turn. Dc in second dc, dc in next 3 dc, dc5tog (uses 2 dc, dc5tog, 2 dc), dc in next 5 dc. Row 4: Ch 3, turn. Dc in second dc, dc in next dc, dc5tog (uses 2 dc, dc5tog, 2 dc), dc in next 3 dc. Row 5: Ch 3, turn. Skip first dc, dc5tog (uses 2 dc, dc5tog, 2 dc), dc in next dc. Fasten off and secure. Row 1: On last stitch of prior row, before pulling through last two loops of last stitch, change to diamond yarn and pull through. Ch 3, turn. Dc in second dc, dc in next dc, dc3tog (uses dc3tog and 2 dc), dc in next 9 dc. Row 2: Ch 3, turn. Dc in second dc, dc in next 5 dc, dc3tog (uses 2 dc and dc3tog), dc in next 2 dc, dc in top of turning ch. Row 3: Ch 3, turn. Dc in second dc, dc in next dc, dc3tog (uses dc3tog and 2 dc), dc in next 4 dc, dc in top of turning ch. Row 4: Ch 3, turn. Dc in second dc, dc in next dc, dc3tog (uses 2 dc and dc3tog), dc in next 2 dc, dc in top of turning ch. Row 5: Ch 3, turn. Dc in second dc, dc in next dc, dc3tog (uses dc3tog and 2 dc), dc in top of turning ch. Row 6: Ch 1, turn. Sl st in dc3tog, Hdc in next dc, dc in next dc, dc in top of turning ch. Pull finally loop out a bit and secure. Complete other diamonds across and then make color change on this last stitch for next section. Row 1: Form a slip knot, find the stitch that is 11 stitches before the dc3tog stitch and slip stitch the slip knot to it. Ch 3, dc in the next 8 stitches, dc3tog (uses 2 dc and dc3tog), dc in next 2 dc, dc in top of turning ch. Row 2: Ch 3, turn. Dc in second dc, dc in next dc, dc3tog (uses dc3tog and 2 dc), dc in next 6 dc, dc in top of turning ch. Row 3: Ch 3, turn. Dc in second dc, dc in next 3 dc, dc3tog (uses 2 dc and dc3tog), dc in next 2 dc, dc in top of turning ch. Row 4: Ch 3, turn. Dc in second dc, dc in next dc, dc3tog (uses dc3tog and 2 dc), dc in next 2 dc, dc in top of turning ch. Row 5: Ch 3, turn. Skip first dc, dc3tog (uses 2 dc and dc3tog), dc in next 2 dc, dc in top of turning ch. Row 6: Ch 3, turn. Dc in second dc, hdc in next dc, sl st in dc3tog. Fasten off and secure. At the end of each section, extend the last loop and secure it. Once diamonds are completed between the sections, if the next section is going to be the same color as the previous, just pick up and continue with the reserved loop. If a color change is desired, pull loop back and insert hook back into last two loops of last stitch of the row. Knot new color close to work. Yarn over with new color and pull through both loops. After completing a ripple section, turn the work as though to start the next row. Start the diamonds on this side. The first row of a ripple section will be worked on the sides of diamonds. When making stitches, make a stitch in the same stitch that the first stitch of the first row of the diamond was made and in the same stitch that the last stitch of the first row of the diamond was made. Make two stitches over each dc or ch 3 on the sides of the diamonds. Make a stitch in the dc5tog at the top of each diamond. Going from small ripple to big ripple – diamonds will be placed in every other “valley”. The edge stitches of the first row of the diamonds will be in the center dc of the 5dc at the top of the adjacent “peaks”. The big ripple has a dc5tog in the valley of the small ripple and then has 19 dc. The first 8 dc are in dc stitches. The next dc is in the same dc as the first stitch of the diamond. The next 10 dc are along the side of the diamond, with 2 dc over each dc or ch 3 that form the edge of the diamond (5 rows of the diamond with 2 dc in each make up the 10 dc). The 5 dc in one stitch for the peak will be in the dc5tog of the diamond. For the 19 dc going back down to the valley, 10 will be along the other side of the diamond, 1 in the same dc that the end stitch of the first row of the diamond, and then 8 in dc continuing along the small ripple. That should bring you to 2 dc before the dc5tog in the valley. Going from a big ripple to a small ripple – diamonds will be placed in every deep “valley”. The small ripple will have 8 dc coming down from the big ripple. At the valley there will be 2 dc and then a stitch that has an edge stitch of a diamond. To make the dc5tog for the small ripple valley, you will use 2dc, the shared dc, and make the last two parts over the edge dc or ch 3 of the diamond. The remaining 4 rows of the diamond give you 4 edge dc and ch 3 spaces to make 2 dc each to form the 8 dc climbing to the peak of the small ripple. The 5 dc will be worked in the dc5tog at the top of the diamond. The 8 dc coming down to the next valley will be in the dc and ch 3 spaces along the side of the diamond for the first 4 rows. The dc or ch 3 sp on the side of the first row of the diamond, the shared stitch and 2 dc will make up the dc5tog of the valley. Convert from one type of small ripple to the other by putting a diamond in every valley. The edge stitches of the diamonds will share the center stitch of the 5 dc of the peak of the ripple. Diamonds can also be made on other diamonds to make fields of diamonds. Just follow the basic rules as established above to keep stitch counts consistent. Thank you for sharing this pattern. It is so pretty! I am really lovin’ this. In fact, I have suggested it as a CAL in the Vanna’s Choice Ravelry group. …and I am agreeing with Bev on using this as a CAL. I like! This is a wonderful pattern – easier than it looks. I am about one-third of the way finished and am having fun picking out color combinations. The variations to this pattern are endless! Thanks for sharing another remarkable afghan pattern. Love it… going to try this one. This would be very lovely laprobe for a wheelchair-bound person if made in a medium size or smaller. What’s a CAL? I know what a WIP is but what’s a CAL? Thanks for sharing this pattern. It’s nice to see something other than the regular run of the mill ripple. All of your patterns are incredible and really beautiful! Crochet-a-long. Sometimes groups will all work on the same project at the same time. I don’t usually try intermediate patterns but this one is on my list. What is WIP? Am giving this a try in Encore worsted. Just curious how many rows for each of the ripples. Any help would be appreciated. Thanks. There aren’t any set rules. It’s a design-your-own kind of blanket. I did four rows of the ripples at the beginning and end and eight rows for the middle ripples. This is a lovely pattern; thank you for sharing. I am crocheting it but am having a little difficulty with the 6th and 7th row…won’t give up thou. Hooray!! This is E X A C T L Y the type of pattern I have been looking for…!!! I needed guidance on how to create a ‘diamond shape’ that could be worked into the overall look of a throw (per request) without needing to be pieced. I postponed making it because didn’t know quite how to go about it. This will help me create a very nice blanket to please the male recipient. THANK YOU!! Thank you! Thank you. Just wanted to say… ripples never really thrilled me… but this was does excite the senses! I both knit and crochet and was really looking for a knit pattern when I saw this and knew it was PERFECT for the project I am planning. Thanks again! ripples. but I must say iam confussed how how it is done. I have the first 3 rows done but am not sure how to proceed from there. Have you made a tutorial on it? I don’t have a tutorial on this one. To have one it would probably have to be a series. I might consider making a series of videos next time I make one of these, but currently just don’t have the time to devote to it. Hello, win papes, the trick to this pattern is NOT to let the color effects draw your attention (sight) from the true ripple pattern. All you are doing is substituting one new color at a time for several stitches, running your carryover color on the back stitch. Use stitch markers if it will help. Just remember, it is just the common ripple inspite of the color changes. Sincerely, Joy, currently in Orlando. Mama, The second paragraph should read, “mercerized” cotton. Maybe you can edit the pattern, for less experienced crocheters. I was surprised to see that because it looks like acrylic yarn. Anyway, I like this pattern. Great imagination. Thanks for the correction. I changed that in the pattern. There are a couple of the diamonds that are made from Plymouth Yarn Jeannee Worsted which is about half cotton half acrylic, but otherwise the diamonds and all the ripples are made of Knitting Fever King Tut which is 100% cotton. I love this pattern, and am thinking I would like to substitute the diamonds for afghan blocks, how large are the diamonds on your blanket? Approximately 3″ (7.6 cm) square. Superb! Thanks so much for letting me know. I love love love this pattern, BUT it’s starting to piss me off because when I started the second set of ripples it didnt all line up right unless I didnt make the first set long enough. Could you send me a picture so that I can see what is happening? I am so sorry this has been so frustrating. I really hesitated to even post this pattern because unlike all the others I’ve posted, it’s not a traditional pattern. It’s more of a guide to creating your own pattern. I had posted a picture of my blanket on a forum and several of the readers wanted a pattern, so I came up with this guide. If you are still interested in continuing it and think I could help, I would be glad to try. I love Project Linus. I’m so glad you make blankets for them. Sounds like your first Big Ripple Row will be a B row. Then coming back will be an A row. I did a practice piece with the multiple of 44 plus 10 (54ch). I think the pattern has a misprint in the small ripple A. Row 1 says to Dc in 4th ch from hook, dc in next 2ch, 3dc in next ch, dc in next 8ch, dc5tog,dc in next 8ch,*then so on and so forth. This doesn’t work out for the following rows.What I ended up doing was this I dc’d in the 4th ch from hook, dc in next ch, dc3tog (uses next 3ch),dc in the next 8ch,5dc in the next ch,dc in the next 8ch,*continue in pattern to last 6 ch, 3dctog,dc in next 3 ch. Row 2 also needs to be modified as well. Big Ripple B. At the end of the row last 11dc and turning ch.Dc in next 8dc,3dc in next, I think that should be 3dctog as well. Small ripple A is supposed to have the increases at the two ends because the edges are at the peaks. 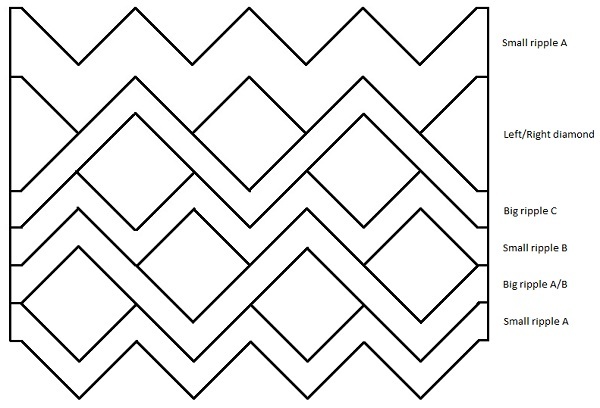 Small ripple B has the decreases at the edges because the edges are at the valleys. You are just changing the Small ripple A to the small ripple B. Which of Big Ripple A/B you need just depends on which direction you are going. You are converting A to B and B to A.
hi thank you so very much for all your help. still confused. I am on the 2nd row. (uses 2dc,dc5tod,uses 2dc). I am ready for the first valley. how is it done. You should be at the place on the row where the next 5 stitches you will be working in is dc, dc, dc5tog, dc and dc from the prior row. You will use these next 5 stitches to make a dc5tog. It doesn’t need revision. Others have successfully used it. i am trying to do the crazy ripple but a bit confused. I can do the dc5tog but not understanding when it says dc5tog(uses 2dc,dc5tog,2dc). Also dc3tog(uses 2dc and dc3tog). When I say “uses” I am referring to the stitches that are being sewn into from the prior row. I put those notes there so that you can know if the rows are lining up like they are supposed to. The decreases should line up with decreases from the prior row and likewise increases with increases. The dc5tog stitch “uses” five stitches from the prior row because it decreases 5 stitches to 1. It should be centered on the dc5tog from the prior row to line up correctly. So to make up the 5 stitches, it will have the dc5tog below it in the middle and 2 dc on either side. Since the dc3tog stitches are on the sides, they aren’t centered on the prior row dc3tog, but rather the prior dc3tog is either on one side or the other, so my note is just pointing that out to make sure everything is lined up correctly. The instructions were great until the 3rd row. Unclear on some of the changes. The third row of which section? I don’t expect you to figure out the multiples That is why I also give starting chains for different widths. Since you are using Super Saver you can use a little bit bigger hook, like an I or J so that the 186 beginning chain will probably work out to be close to the 42″ width you are looking for. Ty so much mama! I’ll give it a try!! help! I’ve been crocheting for yrs but just don’t get it. Just can’t seem to figure out pattern. Would really love to make this for charity. Think I have the first three rows right but need more info. Do I just follow diagram and use picture? Would appreciate any help I can get. I’ll keep trying. I didn’t write this one as a traditional pattern that duplicates the exact blanket I made, but more of a guideline for designing blankets in this style. The diagram is for showing all the available elements that can be used to design the blanket and to show what I have called them in the written directions. I have been saving up yarn scraps to make another one of these blankets, and on the next one I will make a set pattern and write it line for line like a traditional pattern so that it can just be duplicated. I love all your patterns and have printed off many of them. I have been interested in all these reactions to this particular pattern. I haven’t even tried it yet, but if you get around to writing it as a pattern let me know!!! Some of these questions are scary. haha Great crocheting. I love this pattern! I did attempt at my own risk and the project finished beautifully! I finished tonight in celebration of Independence Day 2013 in red, white and blue. It will be a gift to one of my grandchildren. Thank you so very much for sharing your creativity. You are a blessing to me. I just finished this beautiful and unique afghan in red with 3 variegated, complementary worsted acrylic yarns as the diamonds. Instructions look daunting, but are simple and clear once you get going. I finished it in record time because it is addicting. Thank you for the pattern. Looks like my kind of insanity. Can’t wait to try it. This pattern is fantastic, love it and will make it, since I do have so many little left over yarns stored away. I love how this is turning out so far. I’ve always like strangely colored things if they are bright and rainbowy with little rime or reason to them. And using up scrap yarn in this baby blanket has given me reason to to just that. Also the freedom to row and diamond as I see fit is sweet. I messed up the placement on my fifth row of diamonds so I couldn’t transition to a big ripple without pulling diamonds out. Which I didn’t want to bother with. So I just filled in the whole row of valleys in with diamonds and will do another little ripple next. It’s almost the middle so I might just use it as a transition point to finish the blanket in a reverse pattern of the currently laid ripples/diamonds. Thank you so much for the insane, easy-ish, and extremely unique pattern. 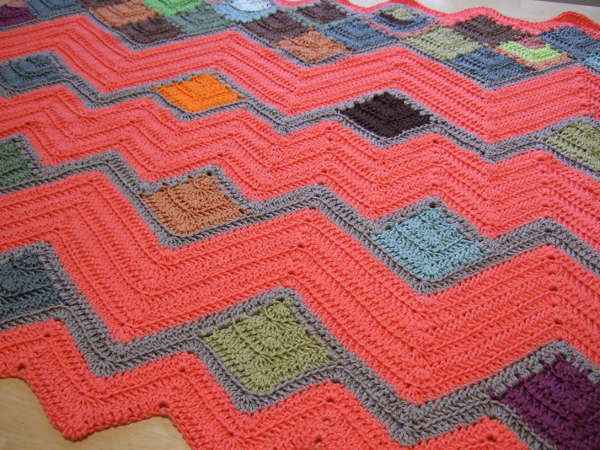 This blanket looks like a great project to use up my leftover yarn! The part that stumps me though is how to make the diamonds. I would like to make the whole blanket the way yours is at the bottom (with the diamonds spaced out and have big ripples in between). I’m am still a little new at reading new patterns so that could be why I can’t figure out the diamonds. I don’t know when I will ever get it done, but my goal is to write another pattern like this one, but instead of this design-your-own style, in a set design. I started this project for my brother’s wedding present. They are avid hunters so I picked light tan, dark tan, forest green, and variegated camo for the colors. I started with two rows of each solid color in the small ripple, camo colored diamonds, and now I’m working on the big ripple rows. I have to frog about 4 rows because I missed the 5 DCs at one of the peaks; but other than that this has been a pretty easy pattern to follow! Thanks so much for the pattern! Thanks so much for this beautiful pattern! I crocheted several afghans for Christmas gifts and had left over yarn. This pattern was perfect for using up the odds and ends. I’ve done more knitting than crocheting so I would consider myself between a beginner and intermediate crocheter, but I found this pattern easy to follow after starting with a sampler in the smallest size. Once you get the rhythm of the stitch counts and whether you need to “dc3tog” or “3dc in next dc” on the ends, you can adjust this pattern to your needs. Everyone that has seen what I’ve created so far has loved it, so I’m sure I’ll be making more. Thank you so much for sharing your amazing patterns! I’m going to really enjoy this one! Looks like so much fun! What an awesome pattern! Thank you! I started to make this afghan as a gift for my nephew who has been diagnosed with Leukemia. However, after only the first row I already am confused as I can’t get the stitches in the second row to line up. If you can help me out I would greatly appreciate it. When you chain 3 and turn at the beginning of row two, looking along the back side of row 1 your chain 3 is coming from the first of 3 single dc, then there are three dc made in one chain. On row 2 “Dc in 2nd dc, dc in next dc” will be made in the second and third of these first three single dc. “3 dc in next dc” will be made in the first of the 3 dc in one chain of row 1. Looking on down the back of row 1, after the 3 dc in one chain there are 8 single dc and then a dc5tog. So on row 2 “dc in next 8 dc” – the first two of these will be in the last 2 of the 3 dc in one chain from row 1 and the last 6 will be made in the first six of the 8 single dc. Now you will have 2 more single dc before the dc5tog. The “dc5tog (uses 2 dc, dc5tog, 2 dc)” of row 2 uses those last 2 single dc, the dc5tog, and two more single dc from row 1. Going along the row, the “5 dc in next dc” will always be made in the center of the 5 dc of the prior row and the dc5tog will always use 2 single dc, the prior row dc5tog and two more single dc. The eight single dc will always be in six single dc and the two dc to the side of the 5 dc of the prior row. I have to admit I’m feeling kind of dumb right now because I’m not a neophyte and I see all these people commenting on how easy this is and yet I can’t get past the first ripple. My ripple A is beautiful and I’m ready to move to the next step which I *think* is the right-side diamond if I’m following the construction laid out in the picture (which I am until I get the hang of it, at least). But right off the bat, the dc3tog makes a bump because it goes in the 3-dc fan and I know I’m not doing it right. Am I supposed to do the big ripple somehow and then fill in the diamonds? Am I supposed to turn it upside down and start the diamond where I started the ripple? I definitely wouldn’t consider this an easy pattern no matter what others are saying. I put it in the advanced category. Actually the diagram is to be followed from the bottom up, which is the way you crochet, building up rows to the top. So the next step after the A ripple is putting complete diamonds in every other “valley”. Lovely afghan, just what I was looking for. I will make it in the colors of red/green/white for a Mexican Lady. She will love it. First thank you for the pattern. I love this blanket and have been wanting to make it for the last 2 years but the pattern looked too completed for me. Last month I decided to just go with it and try. To my amazement I was surprised how easy it is to make. Now I’m almost finished and want to add an edging to the sides. Do you have any suggestions as to what kind of edging would look best? I love the look of this blanket! I think it will make a very interesting baby blanket in bright colours for lots of stimulation. Thank you so much for creating it and making it available for free.